Times Square by day as busy as by night. Funny is when asked if I like New York, I always smile and say: «This is where I will be living in my next life». It is indeed a very fascinating city in this busy world of today. You meet all nationalities and cultures under one big roof. According to Wikipedia, it is the most densely inhabited urban agglomerations in the world. That is why it is difficult to write about New York in just few lines or few paragraphs as there is so much happening on all levels and on all aspects in many angles and interests. For many people, New York is synonymous to exceptional shopping and fashion, for good food, the Plaza Hotel, Madison Avenue, Central Park, high earning job, 9-11… the list can go on and on. To start from the beginning, historically speaking, the Dutch founded New York as «Nieuw Amsterdam» in 1614. The brother of York’s duke, King Charles the Second, sent warships to attack the Dutch in 1664 and renamed it New York. Now let’s walk between these blocks and discover the Big Apple. In my opinion, you have to be a tourist and act like a tourist hence take the bus tour from Times Square. It is probably where everyone wants to start with their New York experience. Times Square has like 40 theatres from Les Misérables, Phantom of the Opera, the Lion King among others. Most buildings are empty as landlords make more money from advertising bill boards. The average annual fees on media and advertising are about 10 million dollars a year as a result the offices are empty. It is fascinating to know that the first time the ball dropped in Times Square was in 1907 on New Year’s Eve and since then it is the ritual. Rockefeller Center, another important stop, is famous for its ice skating ring that we see in most movies. It opens from October till April every year. Next to the center, there is the Diamond District with around 240 shops controlling the diamond in ustry and where no free samples are given. 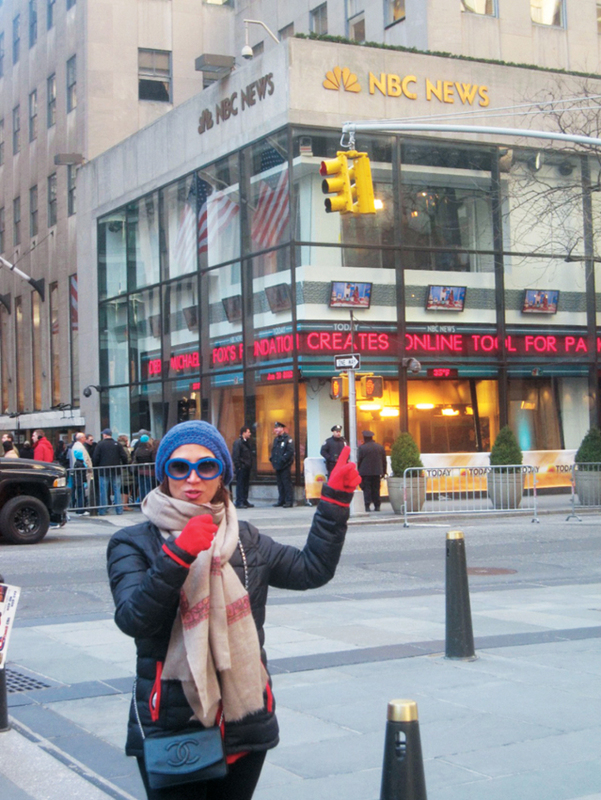 NBC studios are also opposite the Rockefeller where the famous Saturday night live show is aired. Saint-Patrick famous chapel for weddings. 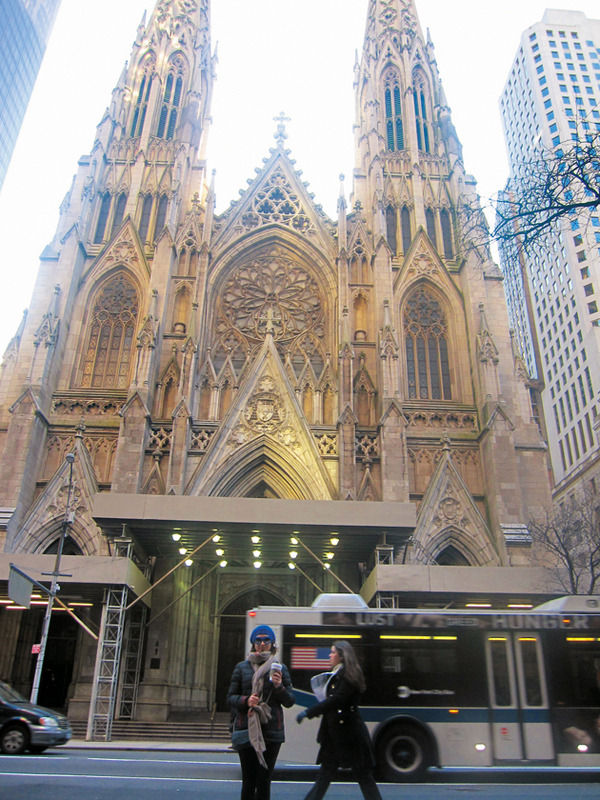 Not far from there, Saint-Patrick cathedral, it is famous and popular for weddings. Brides and grooms are on waiting list to have their one hour wedding at this particular famous chapel. Saint-Patrick is well-known to have weddings every hour. On the other side of the cathedral, stands the 1924 oldest building SAKS on 5th Avenue, a competitor to Macy’s most believe. The Empire State building, this iron flat building that looks a bit like the Big Ben is not to be missed. A picture on the top roof is a must of this 102-story skyscraper located in Midtown Manhattan, New York City, at the intersection of 5th Avenue and West 34th Street. It is featured in many films and movies. My favorite of all would be the 1939 romantic drama film «Love Affair». Nevertheless, it is not today’s tallest building of the world. Greenwich, Soho, Nolita, China Town, Wall Street are interesting areas to visit. Greenwich is the artistic district where famous musicians, bohemians, writers, comedians used to reside, hence now is considered the most expensive area to live. Soho or South of Houston street is the most unique shopping area in the world. 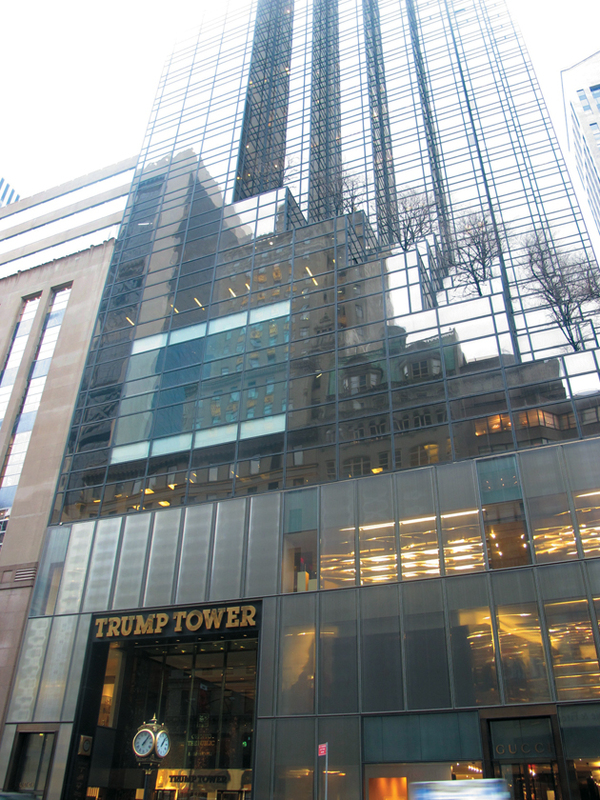 With everything from art stands on the street to high-end boutiques, Soho is an exciting area to visit and even stay in one of its hotels: the Down Town Trump Hotel. Moreover, the Statue of Liberty, its symbolism has grown to include freedom and democracy as well as international friendship. You may visit Ellis Island and Liberty Island either by boat/cruise in summer or by bus. For those planning to visit New York this summer, note that due to extensive damage sustained by Hurricane Sandy, Ellis Island and Liberty Island are currently closed. Liberty Island will re-open July 4, 2013 while Ellis Island will remain closed for the foreseeable future. As for the Twin Towers, in couple of years the new ones will be ready. Meanwhile, you may get some bargains at the Century 21, a unique department store opposite ground zero worth a visit. As for the numerous museums, one of my favorite would be the MET, Metropolitan Museum of Art and of course because they also have one of the nicest collections of antique rugs as important as the ones on display at the V&A in London. It is amazing how all western countries draw huge importance on Middle Eastern and Asian art, it is something we should cherish and appreciate more and more every day. I was also curious to check the United Nations headquarter in New York to view the large square Isfahan rug donated specially for the UN. One of the special features of the 25-square-meter carpet is that the famous verse from the prominent Iranian poet, Sheikh Musleh-Uddin Sa’di Shirazi (1184-1291 AD), oneness of mankind has been woven into it in pure gold. Trump Tower black mirror glass signature.